Happy Easter! Here’s a simple recipe for Peeps™ s’mores and a look at the science of why Peeps get so crazy big in the microwave. The recipe is easy and fun. Take a graham cracker, set a Peep on it, put a couple of Hershey’s Kisses™ on another cracker, pop them in the microwave, and nuke them until the Peep has expanded so it looks like it’s ready to explode (20 seconds seems good). Smush the Peep side and the Kiss side together, and enjoy! Peeps are marshmallows, which are puffed table sugar. Table sugar is purified sucrose. Sucrose, like other sugars, is composed of hydrogen, carbon, and oxygen atoms bonded together. 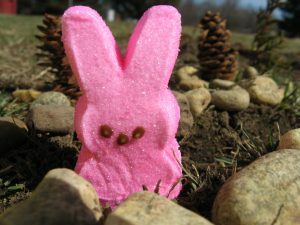 When you microwave Peep s’mores, the energy added to the candy causes the molecules to vibrate. The bonds holding sucrose together loosen, softening the marshmallow, while the water vapor inside the candy expands, exerting pressure on the sugar. Expanding water forms bubbles that cause the Peep to get larger and larger. If you leave the microwave on too long, eventually you’ll supply enough energy to start combustion of sugar. This reaction between oxygen and sucrose leaves you with a burnt marshmallow, and possibly a small fire in your appliance. Make Fake Glass – If you heat sugar, you can make hard candy out of it. If you spread the hard candy onto a cookie sheet, you can make stage ‘glass’. Grow Sugar Crystals – Rock candy is made from sugar crystals. These crystals are fairly easy to grow, plus you can eat the finished product. Experiments on Peeps – Neat website that discusses experiments on Peeps.